The City of Ely, with some of the loosest -- read Non-existent -- alcohol regulations in the state finally stepped up to do something about it. The laws, based on a small Utah city's regulations, provided no real penalties for sales to minors until the THIRD violation in a 12 month period! Two years ago the efforts were gaining momentum when the Mogul, the Conductor, and the Street Sweeper decided to try to recall the entire City Council. 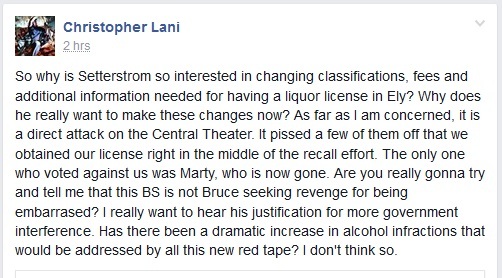 So, now the man who has defended all the wrongdoing at the Railroad that has caused all the hubbub is trying to keep Ely's Liquor Laws from being updated. More personal attacks on his behalf. Man, this fool has a bigger egocentric complex than anyone I've ever met, and that includes Rush Limbaugh. This fool also thinks Bernie Sanders would make a good president if he wasn't so conservative. He also thinks that the same good man they ran out of office with specious allegations should not be permitted to visit our mayor at her place of business. His mouth will continue to get him and his business into trouble. He's still sore that the big hit piece that his buddy Citizen Oy Vey Kane did in the Wendover Muckraker had the opposite effect, though he might like that his audiences are a lot more white these days. This goes back to those members of the community who believe that an American man has no right to marry a foreign woman. And if such a marriage takes place, there's nothing wrong with humiliating and intimidating those in the relationship. There are a dozen members of this community that, like my wife, left their homeland and everything they knew behind, and moved to a strange place (And people like the Movie Mogul and his associates are truly strange) to be with the person they love. The Movie Mogul's comments have left my wife with no desire to go out in the community for ANY REASON! We would have left this community this summer had not the Mogul's companions pressured my former employer to fire me! Back to the subject, the laws regarding sale of Liquor need to be brought up to standards that protect the children of this city, not the lushes that used to inhabit our City Council.